Eleven individuals and programs recognized at Seattle Business’ 2014 Leaders in HealthCare awards ceremony Monday, Feb. 24, brought honor to the UW through their achievements. Johnese Spisso, chief health system officer at UW Medicine and vice president of Medical Affairs at UW, shared the top award as Outstanding Health Executive with Joyce Jackson at Northwest Kidney Centers. The magazine cited Spisso’s patience and leadership to transform UW Medicine into an Accountable Care Organization over the past six years. “Leadership teams developed goals clearly articulated at every level, with progress and feedback shared across all stakeholders,” Seattle Business wrote of Spisso. Dr. Frederick Appelbaum, UW professor of medicine, Division of Medical Oncology, and director of clinical research at Fred Hutchinson Cancer Research Center, received a Lifetime Achievement Award for his contributions to bone marrow transplantation and other advances in blood cancer treatment. He was also honored for his role in the creation of the Seattle Cancer Care Alliance, and in supporting the professional growth of new scientists. UW’s effort to encourage physicians to serve in rural areas of Washington, Wyoming, Alaska, Montana and Idaho – the WWAMI Program – won silver for Community Outreach. The UW Department of Global Health, regarded among the most collaborative programs in the country, won silver for Outstanding Global Health Organization. Dr. J. Randall Curtis, professor of medicine, Division of Pulmonary and Critical Care, and director of the UW Palliative Care Center of Excellence, won gold as Outstanding Health Care Practitioner for encouraging mainstream medical practices to better meet the needs of patients with terminal or incurable illnesses. Paul Yager, UW professor of bioengineering, whose lab pioneered a disposable lab on a chip won gold for Achievement in Medical Devices. William Catterall, professor and chair of pharmacology, whose landmark research on electrical impulses in cells led to alleviating ailments of the nervous system, won gold for Achievement in Medical Research. Beti Thompson, professor of health services in the UW School of Health and a member of the Cancer Research Prevention Program at Fred Hutchinson Cancer Institute, received a gold award for Achievements in Community Outreach (Individuals). She was recognized for her longstanding work in overcoming language and cultural barriers in promoting healthy living and disease-preventive measures. Dr. Elizabeth Loggers, UW clinical professor of medicine, Division of Medical Oncology, received a silver award in the Outstanding Health Care Practitioner category for leading the development of responsible practices under Washington state’s Death with Dignity Act. An expert in sarcomas, she is also the medical director of Supportive and Palliative Services at the Seattle Cancer Care Alliance, and a scientist at the Fred Hutchinson Cancer Research Center. Dr. Julie Gralow, UW professor of medicine, Division of Medical Oncology, director, Breast Medical Oncology at the Seattle Cancer Care Alliance and a clinical researcher at the Fred Hutchison Cancer Research Center. received a silver award in the Achievement in Community Outreach (Individuals) category for improving the quality of life of breast cancer patients through good nutrition and outdoor exercise, and for promoting awareness of women’s cancers in the developing world. Judges for the 2014 Leaders in Health Care Awards were Lisa Cohen, executive director, Washington Global Health Alliance; Leo Greenawalt, retired president, Washington State Hospital Association; Mary McWilliams, executive director, Washington Health Alliance; Joseph Phillips, dean, Albers School of Business and Economics, Seattle University; Chris Rivera, president and CEO, Washington Biotechnology & Biomedical Association; Roger Stark, health care policy analyst, Washington Policy Center. 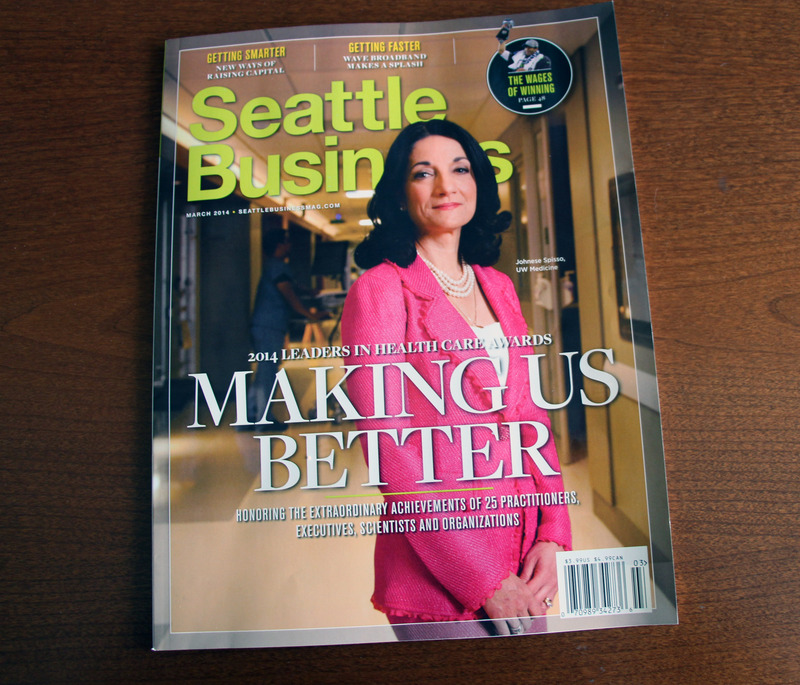 For more on all the winners, please see the current issue of Seattle Business.